When Pro Stock Motorcycle officially became a professional category in the National Hot Rod Association, Ronald Regan was President, a Ford Mustang could be purchased for less than $10,000 and Lethal Weapon, the original, was one of the most popular movies at the box office. 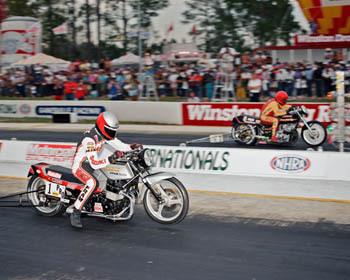 The year was 1987, and although the Pro Stock Motorcycle class had existed for much longer, it was not until then that the NHRA added the two-wheel, naturally-aspirated machines to its marquee pro lineup of Top Fuel, Funny Car and Pro Stock Car. 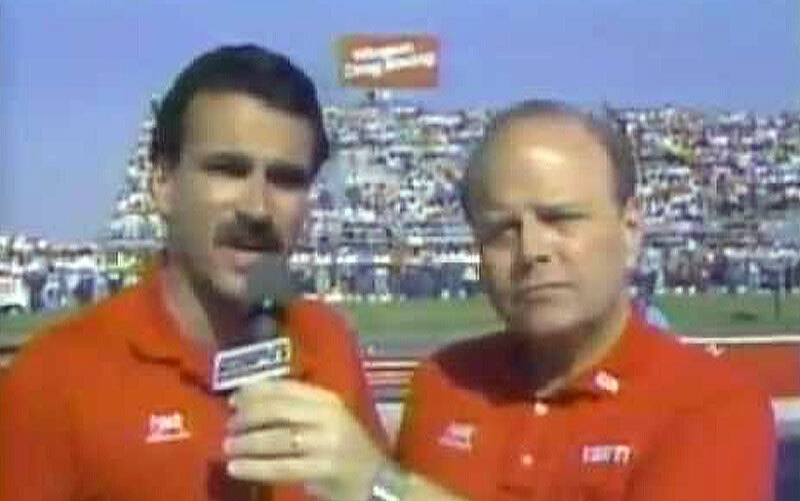 Drag racing historian Bret Kepner on an early NHRA telecast. Now in its 30th anniversary season, much has changed. The state-of-the-art machines are more than a full second quicker and more than 40 mph faster. In fact, the field is on-pace to officially break the 200 mph barrier. 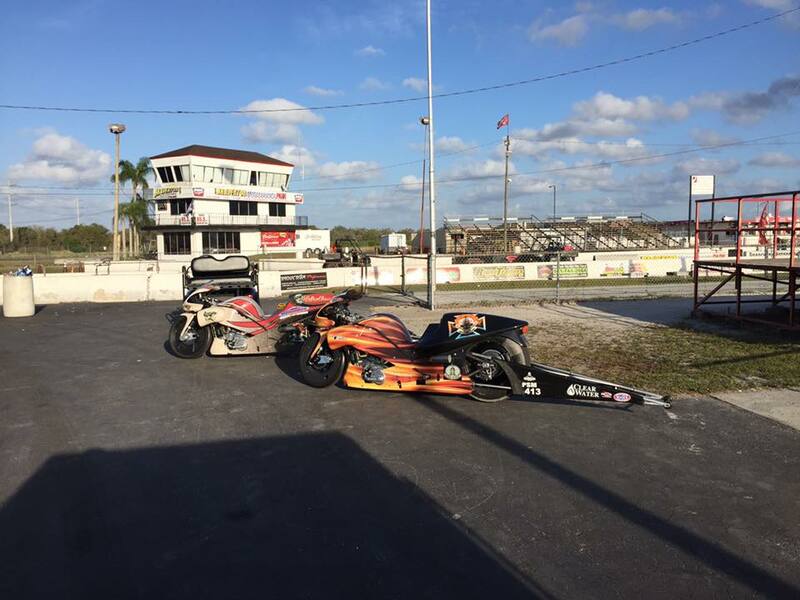 “To me that’s the last real barrier in drag racing and whoever does it will get a lot of acclaim,” said Lewis Bloom, a NHRA TV host since 2001, who started announcing drag races in 1974. Kepner believes the much-anticipated speed barrier could prompt class changes. 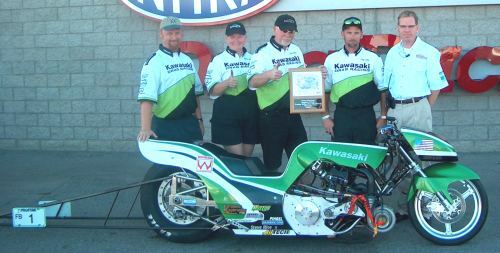 Chip Ellis, who started drag racing in 1989 on a Kawasaki 600, has been with four different NHRA PSM teams. He came painfully close to being the first to break the six-second barrier and does not want to miss 200 mph. “My bike didn’t shift into high gear or we would have been the first six. (Andrew Hines ran the first six moments later) We were the second in the sixes at Chicago in 2005. 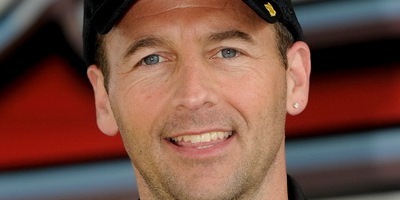 I don’t want to be the second to 200 mph,” Ellis said. Ellis is not afraid of big speeds. 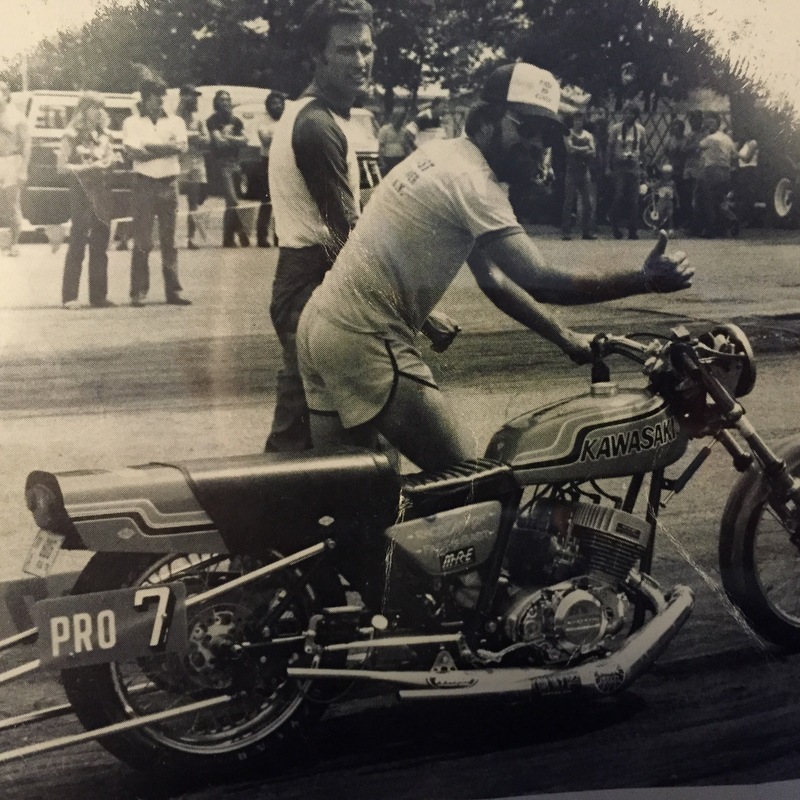 Along with legendary racer Steve Rice, he won an AMA Prostar Funny bike Championship on a turbo-charged, big-tire bike that he went 6.59 at 229 mph on. 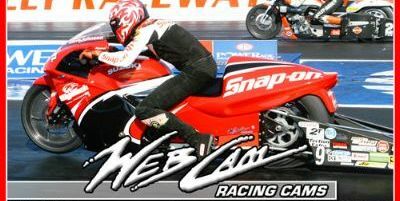 Less than 13 years later Ellis is nearly as quick on his Junior Pippin Pro Stock Buell at 6.76. “It shows you how far technology has come,” Ellis said. Chip Ellis testing his new Buell. Today’s marvels of two-wheel engineering are constantly improving and evolving. 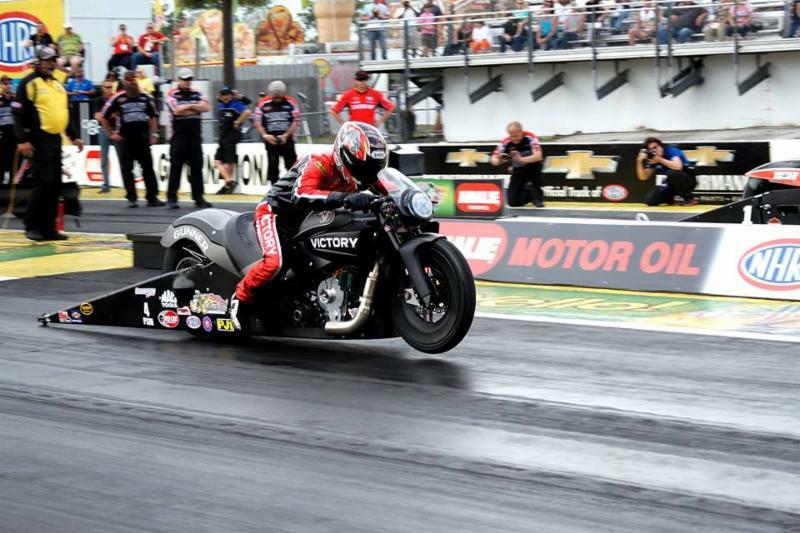 No team has been more dominant in the class than Vance & Hines. The legendary Terry Vance and Byron Hines rose to worldwide fame through their early racing efforts. With riders Matt and Andrew Hines– brothers– and Eddie Krawiec, the team has captured more than a third of the championships with 11. 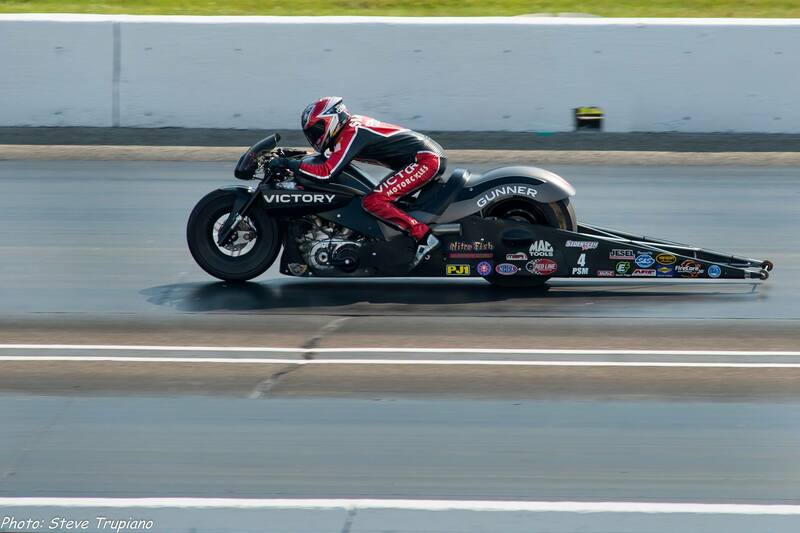 Not to mention Vance & Hines has built the motors of several other winners and champions. 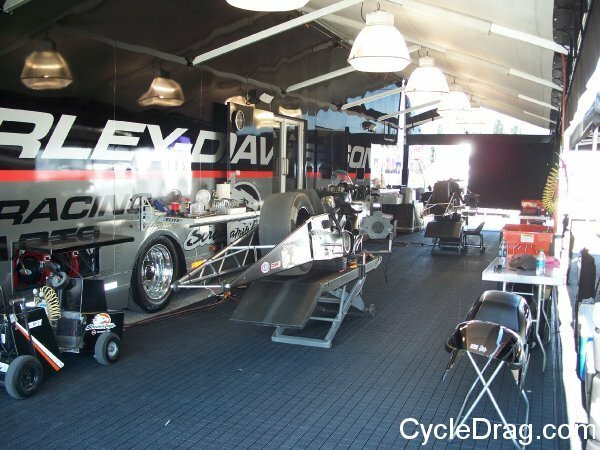 A modern NHRA Pro Stock Motorcycle pit setup – a shinny new rig, a massive stacker trailer, a gigantic canopy and an impressive array of state-of-the art tools. Andrew Hines ushered in the era of the Harley-Davidson V-Rod when he won his first title in 2004, snapping Suzuki’s long reign of dominance. 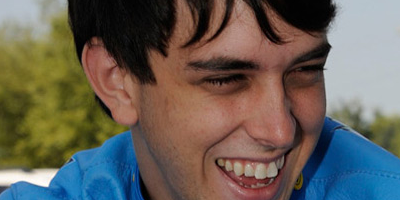 In 2015 Andrew Hines captured his fifth title. 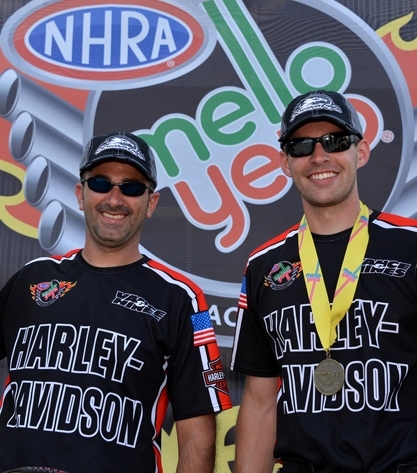 Matt and Andrew Hines – both multi-time NHRA champions. “It’s nice to be the points leader, leading after the first race. It takes a little pressure off. You know, the first — the hardest win to get is the first one of the season it seems like,” Hines said in regard to the 2016 season. Not far behind Hines last season was his teammate Eddie Krawiec, a three-time series champion in his own right. 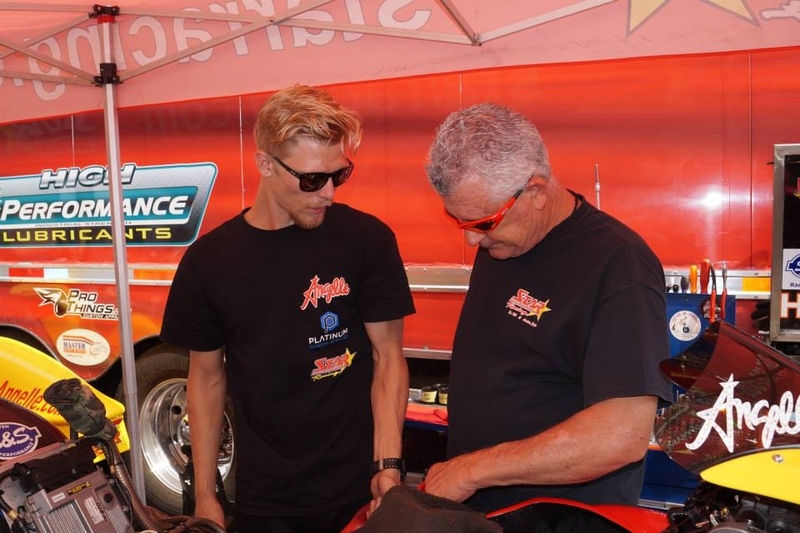 Krawiec, the former track manager of Old Bridge Raceway Park in Englishtown, N.J., has followed the class for a long time, getting his start on a self-funded Suzuki in 2004. In 2003 the late Brian Schultz, son of class legend Dave Schultz, rode Krawiec’s bike. Krawiec says a lot has changed in just the past decade. As an employee of Vance & Hines, Krawiec has a hands-on approach to the development of many of the Suzukis in the class as well. He’s impressed with the current parity. Much has changed on the Harley-Davidson V-Rod since Vance & Hines debuted it with rider G.T. Tonglet at the 2002 Gatornationals. At just 18-years-old, G.T. Tonglet was the first rider of the Vance & Hines Harley-Davidson V-Rod. Now G.T. 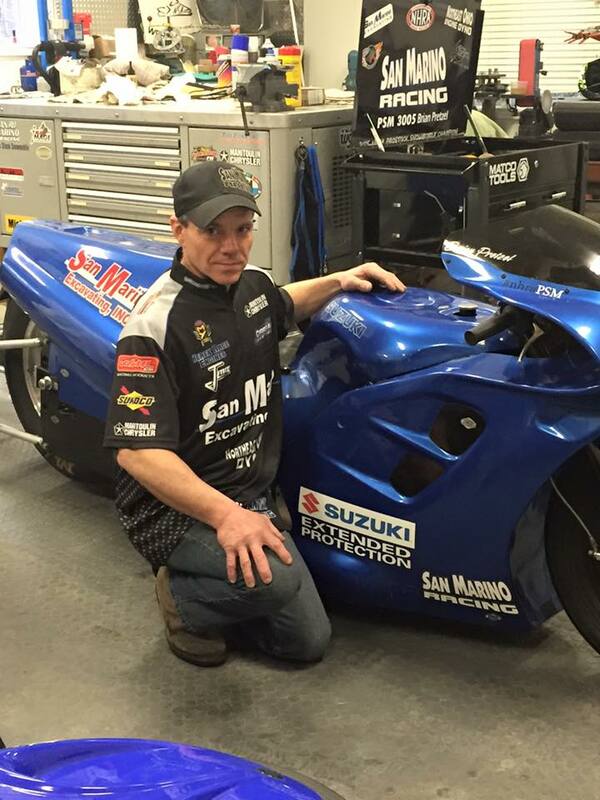 helps his younger brother and 2010 Pro Stock Motorcycle champion L.E., who will again campaign his Nitro Fish Suzuki. L.E. is the only racer since 2004 to win a championship on a Suzuki in a class the respected manufacturer once dominated. 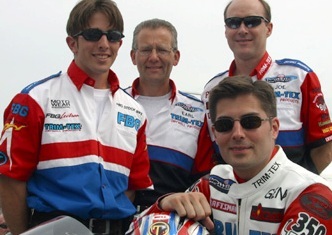 Prior to Tonglet’s championship run, the last team to win a championship on an inline four-cylinder, was one assembled by Trim-Tex Drywall Products president and longtime motorcycle drag racer Joe Koenig. 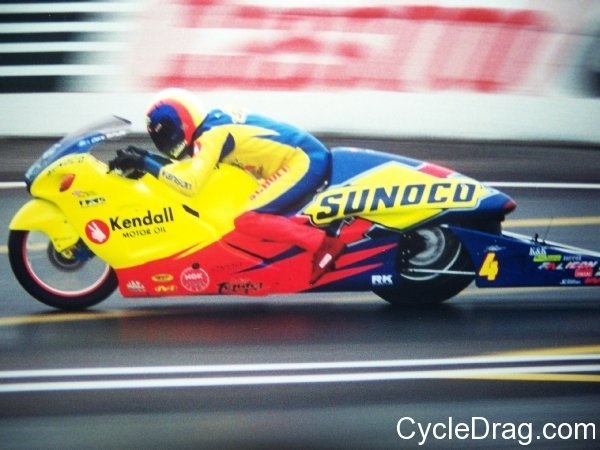 Koenig nearly became the first to put a Pro Stock Motorcycle in the sixes, setting a record of 7.02 in AMA Prostar in 2002, thus earning the nickname “7.0” Joe Koenig. 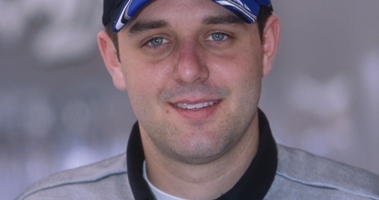 In late 2002 Koenig drafted his dream team by hiring class journeyman Scali, known for great driving skills, and longtime Fast by Gast crew chief Earl DeGlopper. At the final race, the Trim-Tex Drywall Products Suzuki held off Sampey by 78 points to win the title. 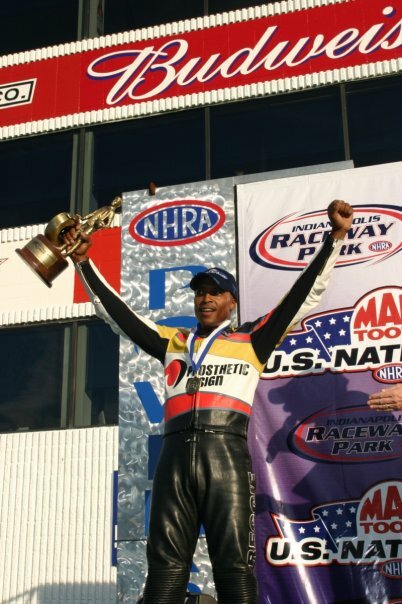 Also in 2003, inspirational, double-amputee Reggie Showers pulled off one of the most remarkable feats not only in the class, but in all of motorsports when he won the NHRA’s most illustrious race, the U.S. Nationals from Indianapolis, Ind. 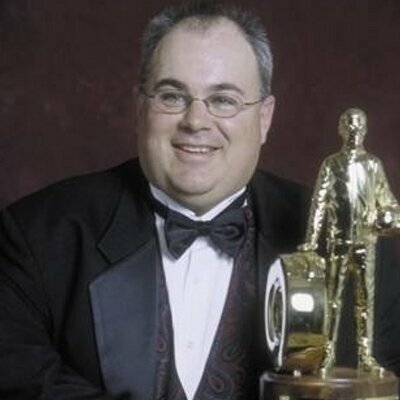 Bill Stephens, an automotive TV host/commentator who worked with the NHRA from 1994-2014 recognizes the importance of the brand rivalry. 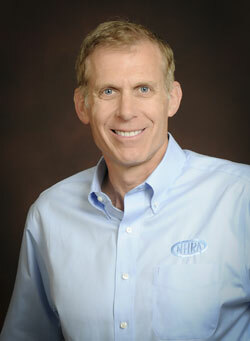 Over his colorful career, Bill Stephens has authored three books and appeared on multiple TV networks. The closest machine to catching Hines and Krawiec last year was the Suzuki of Jerry Savoie, who entered the final race still in championship contention. Since making his debut in 2011, Savoie has been a force in the class. He says the team put in a lot work over the off-season on engine combinations and aerodynamics. Savoie’s effort got plenty of peoples’ attention last year. 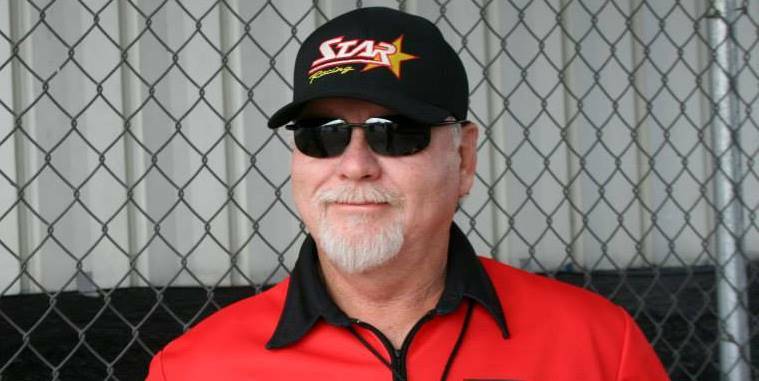 Star Racing’s George Bryce is a six-time class champion as a team owner and was also a competitor himself. “Just winning a race now is almost like winning a championship back then,” Bryce said. Bryce says the way the motorcycle class is valued by the NHRA has increased just as greatly as the E.T.s the machines run. Bryce points to television coverage as something that took Pro Stock Motorcycle and the number of people who wanted to get involved to new heights. 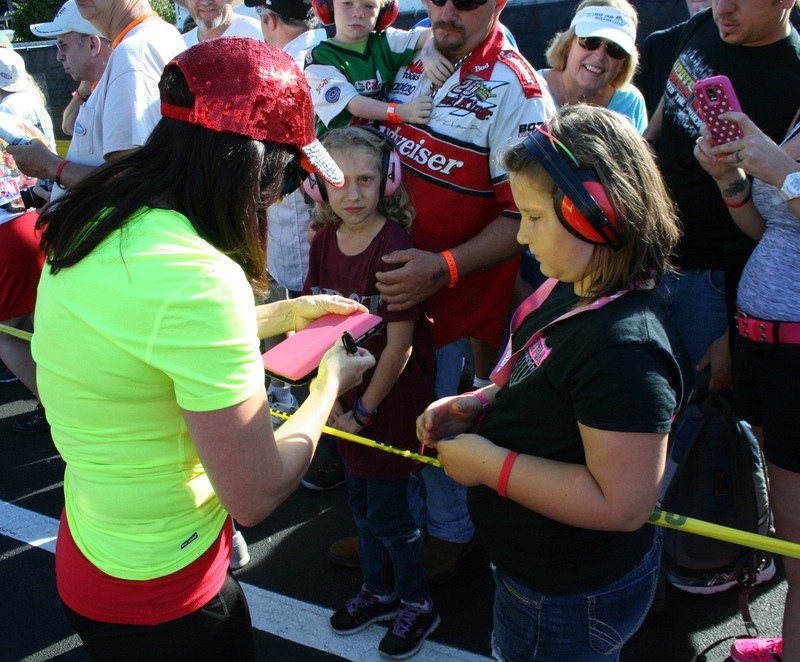 It was announced throughout the first two races with Fox Sports 1, following decades with ESPN, NHRA’s TV audience grew by about 300-thousand people. 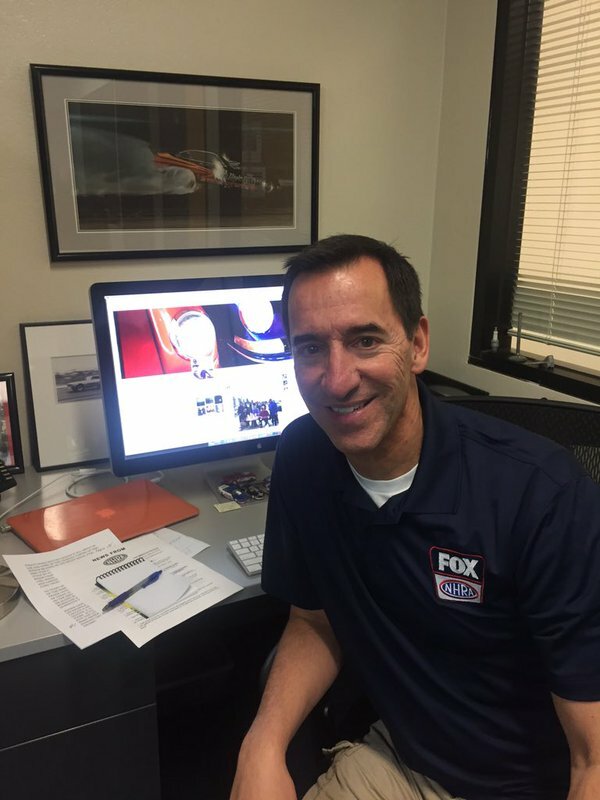 The exciting new charge into the future is being led by Ken Adelson, an Emmy-award-winning multimedia executive, producer, and broadcast journalist who is NHRA’s vice president of broadcasting and digital content/executive producer. 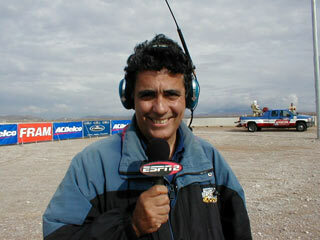 Adelson has more than 30 years of television experience, which includes working as a sportscaster and working with the NBA. 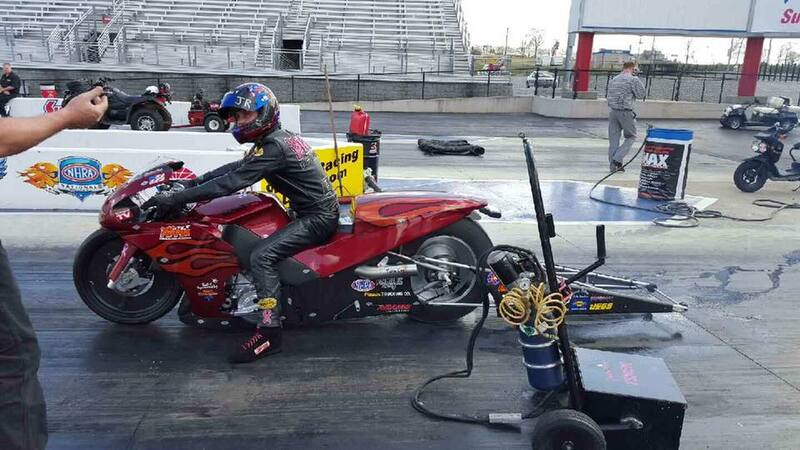 The nation’s quickest motorcycle drag racer at 5.74, Top Fuel legend Larry “Spiderman” McBride is a big fan of the class and watches the television coverage whenever he is not working on his nitro bike. 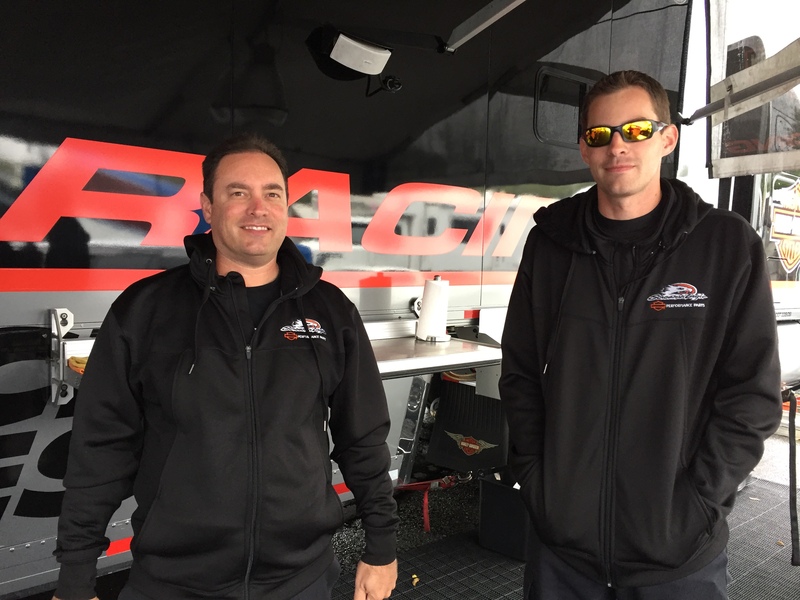 Two of Larry McBride’s favorite Pro Stock Motorcycle racers – Eddie Krawiec and Andrew Hines. 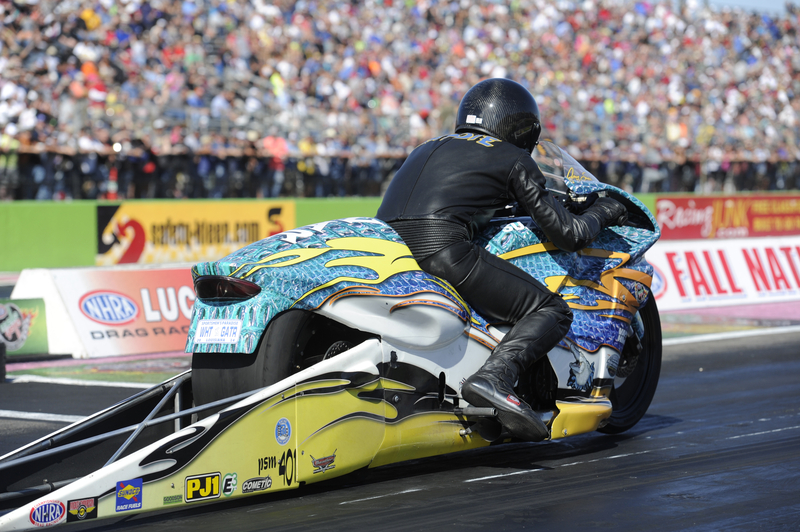 Bryce also says it’s hard to measure exactly how much more popular PSM racing is today. 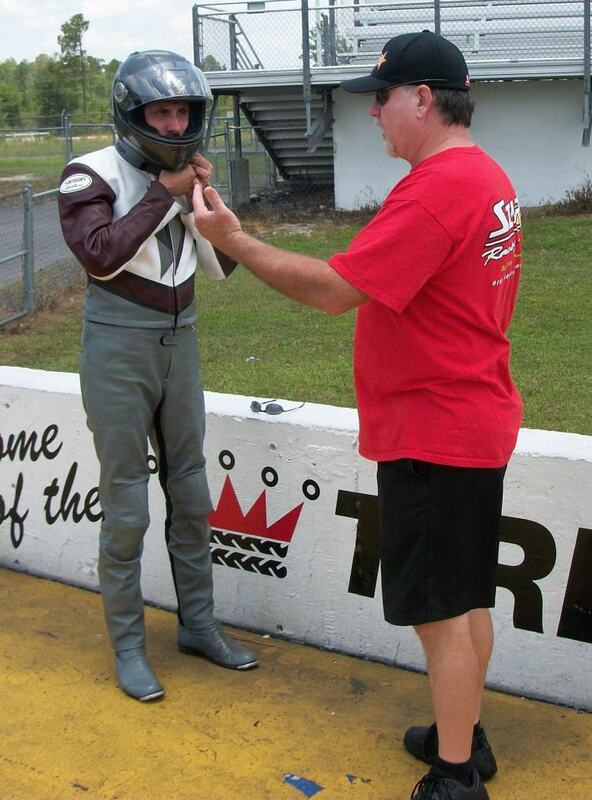 Ron Tornow has attended George Bryce’s Pro Stock Motorcycle school four times. Tornow says the education is invaluable. 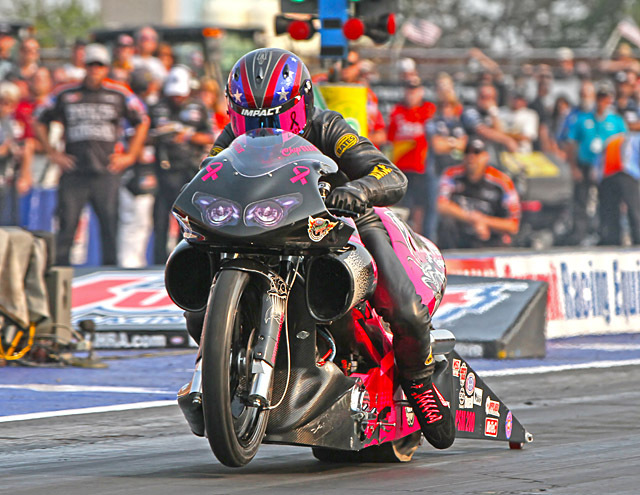 Three-time NHRA world champion Angelle Sampey is perhaps the most famous rider in the history of the class. 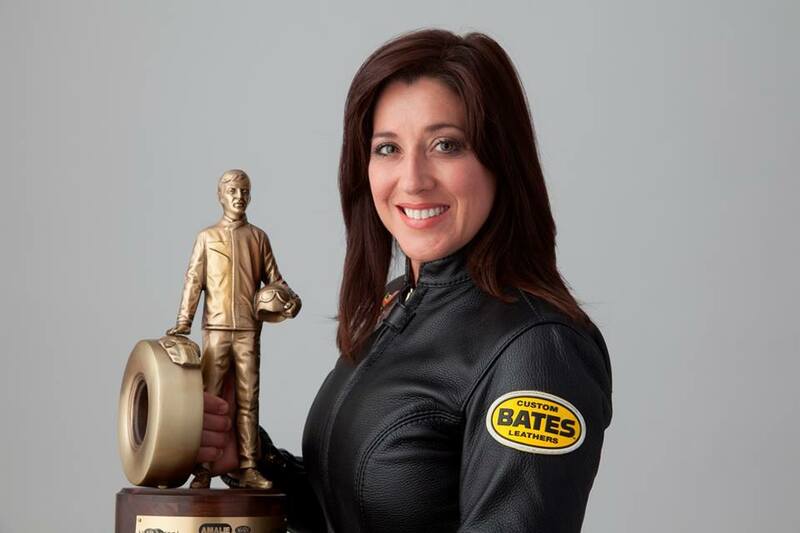 In 2001 she surpassed Shirley Muldowney to become the NHRA’s winningest female driver. After finishing in the top five for 12 consecutive seasons, Sampey took a hiatus in 2008. Sampey is extremely driven to capture her long-awaited fourth title and says her mindset has changed a great deal over the years. Sampey has also seen the class change greatly since her pro debut in Denver in 1996. George Bryce and Angelle Sampey early in her career. Like she did for much of her career, Sampey will race with a teammate this season. Sampey was uncomfortable and felt like she struggled on her motorcycle last year. She’s excited Star Racing has custom made one to fit her petite stature. “George says it’s a little condensed, compact version for his Cajun rocket,” laughed Sampey. Angelle’s first burnout on her new bike. 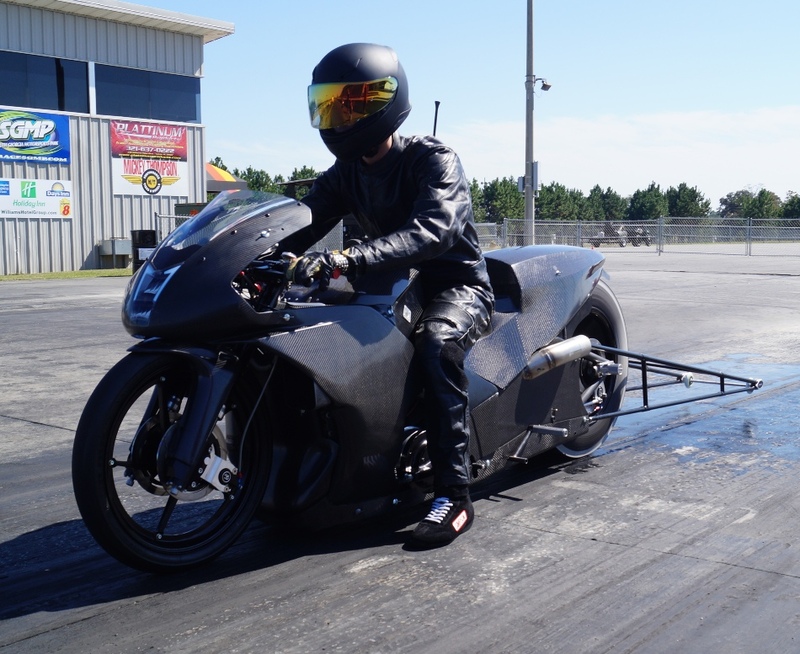 Angelle goes 6.86 on very first pass on new bike. Sampey is also excited Jim and Annie Whiteley, Reed’s parents, of Precision Service Equipment, LLC have come on as a major sponsor. “I’m extremely appreciative. They have given us a great rider in Cory and they are giving us the opportunity win more races,” Sampey said. A true motorcycle talent, Reed, a former motocross and professional Arenacross racer who grew tired of the serious injuries that came along with the massive jumps, is steadfast for a new venture which, although involves much faster speeds, is a sport Reed deems much safer. Cory Reed has done a lot of testing throughout the year. Reed is eager to make his mark in the sport just as he did in the dirt. 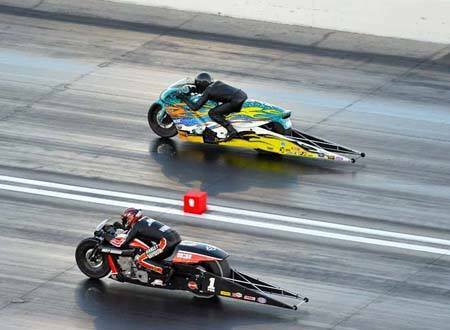 Nobody has made more Pro Stock Motorcycle passes than veteran Steve Johnson of Birmingham, Ala. Johnson’s quirks and eccentricities make him one of the most entertaining characters in the sport. 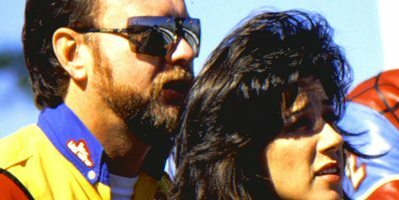 From entering the very first Pro Stock Motorcycle race by air-freighting his bike to the track and pitting out of crate, to 29 seasons of memorable interviews, Johnson has stood out. Johnson has also been a great ambassador of the class, once representing it in an organization called Pro2. Johnson credits a 10-year partnership with Slick 50 early in his career for teaching him the business side of the sport. 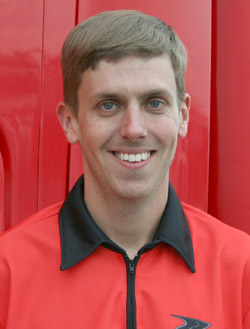 Johnson had a major sponsorship with K&N from 2002-2004 and Snap-On and WyoTech from 2006-2010. He’s currently seeking another partner. Johnson says keeping the truck on the road is just a small part of his duties. 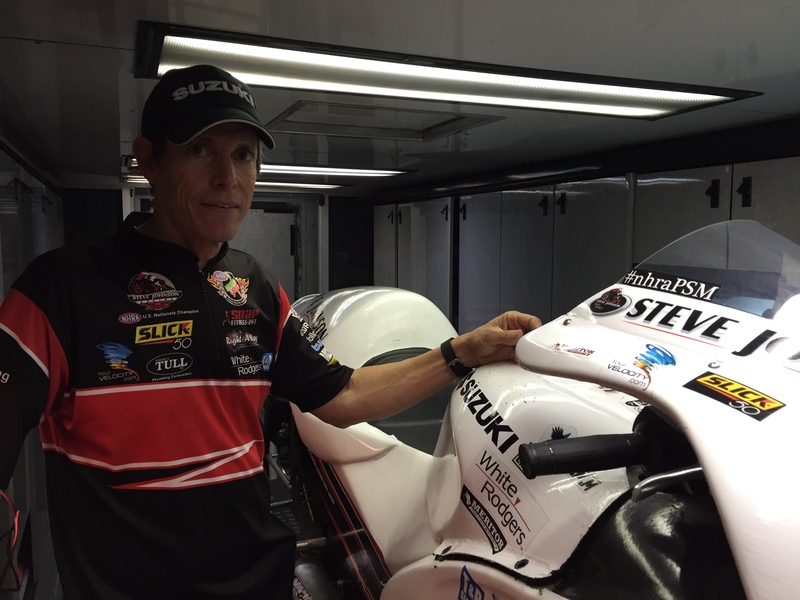 Johnson has remained loyal to Suzuki for his entire career, earning his first win in 2004. Johnson missed the Countdown last year, but has qualified three times and has finished as high as third in the points (1995). It’s the quest for a number one plate that has kept him going longer than anyone. Johnson loves what he does and never considered doing something else. “Really the only other thing I know how to do is cook burgers at McDonald’s, and that’s a scary thought, smelling like French fries every day,” Johnson said. 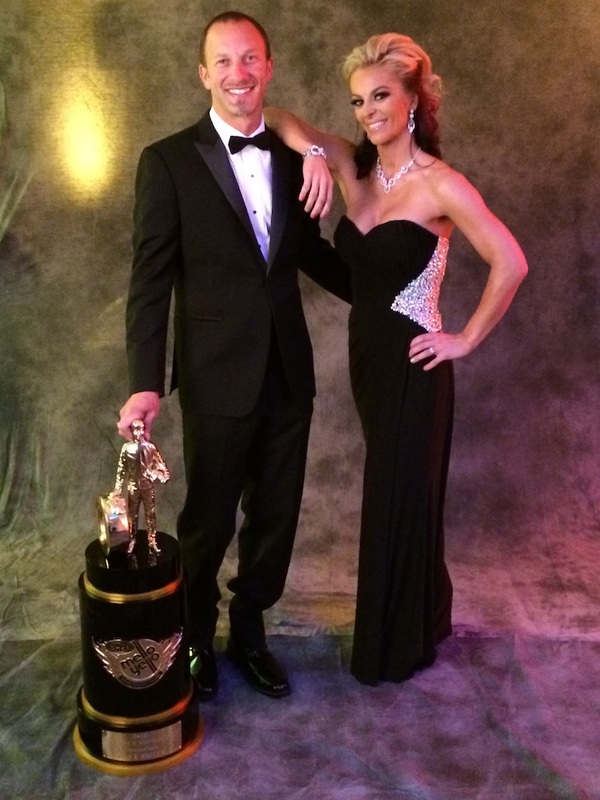 Two-time series champion Matt Smith, along with his wife Angie, had a productive off-season, announcing multiple new sponsorships, following Smith’s fourth place finish in 2015. 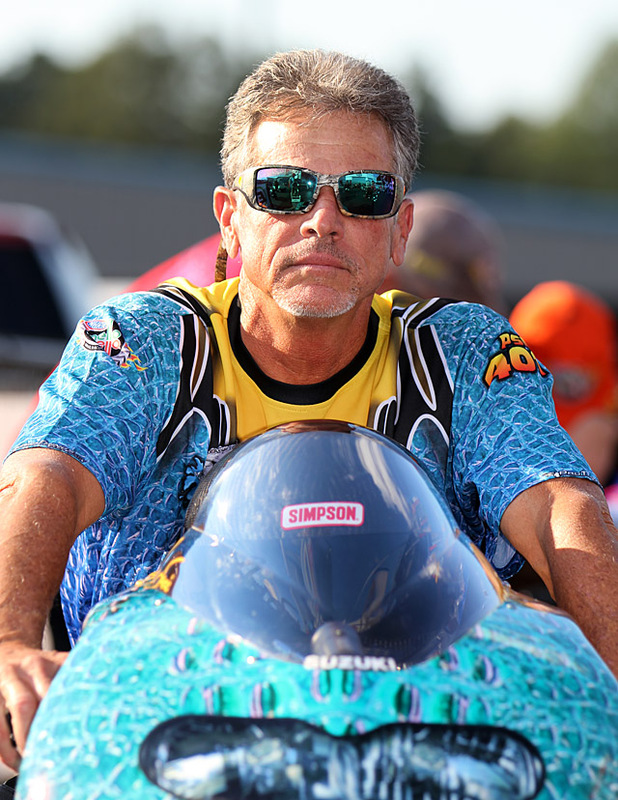 Smith, son of Pro Stock car legend “Tricky” Rickie Smith, has been dragbike racing since 1996 and got his start in NHRA PSM in 2003 on a rented Shawn Gann Oakley bike. 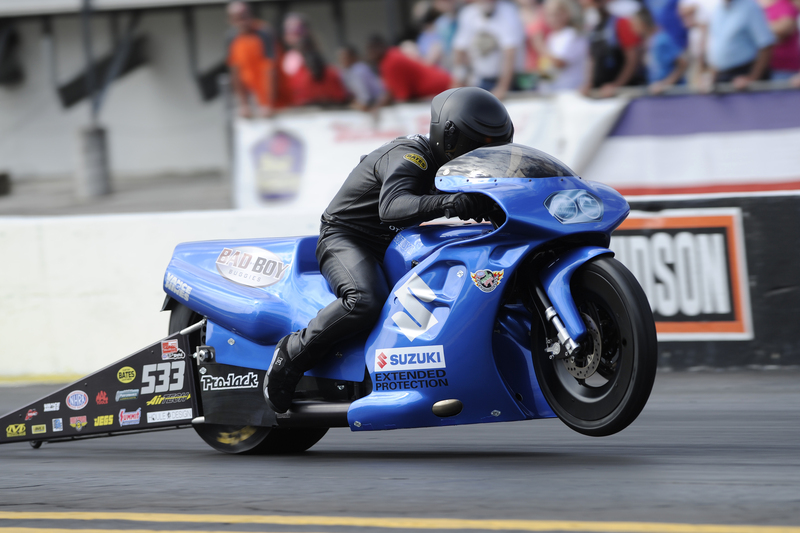 Smith will never forget his first race on a former Paul Gast Suzuki Hayabusa at the Gatornationals in 2004. Smith has found major success crossing over to the V-twin platform. Both of his titles came aboard Buells. A momentous achievement, in 2015 the Smiths introduced a new manufacturer to the class with Victory, a popular American motorcycle company with its final assembly facility in northern Iowa. Angie Smith is very proud of the sponsorship and was impressed with the way Victory sought out a team to partner with. Smith said last year presented a challenge in quickly developing the aerodynamics for the new Victory bodywork, which does not include a massive front fairing like what is in use on the Suzukis and the Buells. Smith says the team made great progress this winter. “We’ve made a lot of progress with the Victory,” Smith said. 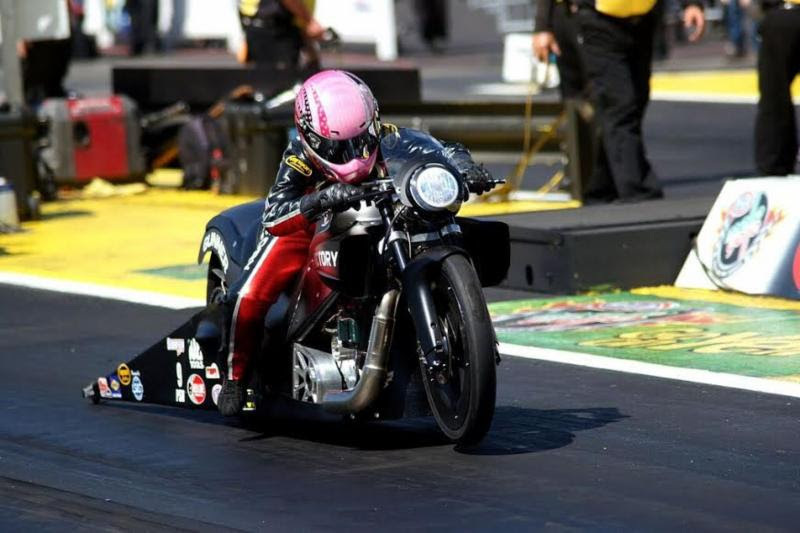 Angie Smith, a former standout in regional motorcycle drag racing circuits like MIROCK (now the IDBL), has seen steady improvement and captured her first win in 2014. As a lifelong fan she has also seen the class steadily improve. Smith credited his involvement with Victory and Mark Stockseth, Elite Performance and Lucas Oil, as something that greatly helped the off-season development. Some of those bullets will be for Ray and Scotty Pollacheck who will be parked right next to Smith at all the races. Pollacheck made his debut in 2010. He’s been to five final rounds and is hungry for his first win. 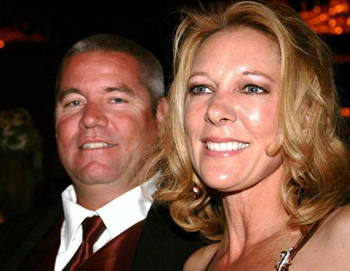 Eight-time event winner Karen Stoffer finds herself in a unique situation in 2016. Stoffer, who made her debut at the U.S. Nationals in 2002, raced under the banner of major sponsor GEICO from 2004 to 2012. 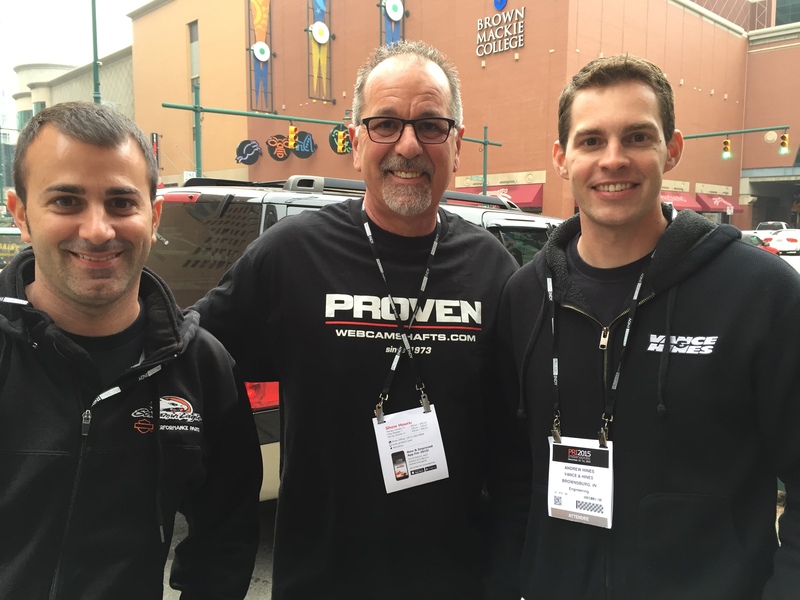 Stoffer has watched the marketing side of the sport constantly evolve. 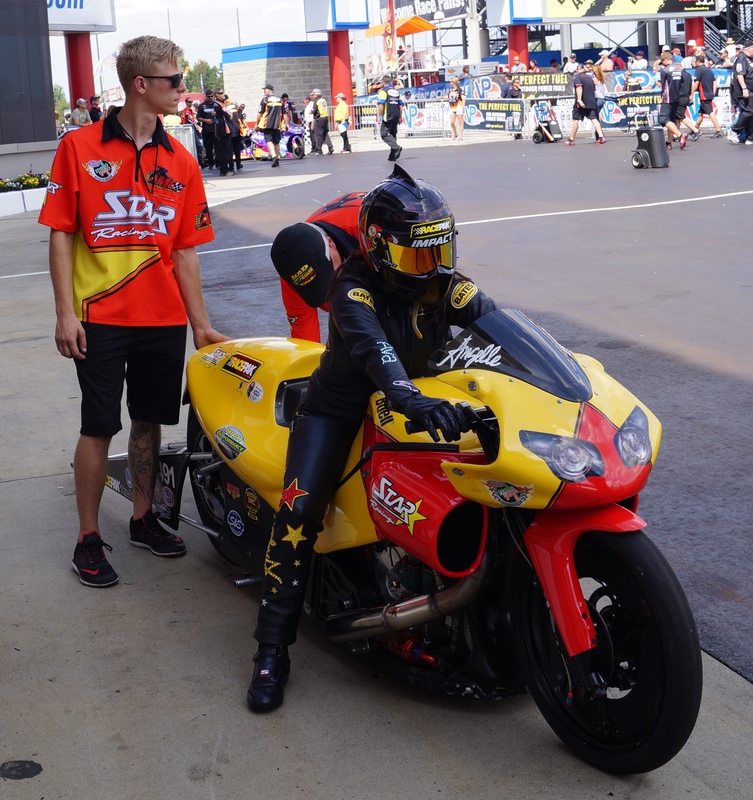 Stoffer and her team’s love for PSM has driven it back into the class with associate sponsors including, Big St. Charles Motorsports, a respected dealership out of St. Louis. The biggest challenge her team faces this year is competing with just one engine – adversity the team thrived on last season. Karen’s husband and crew chief Gary Stoffer, has had to change his game plan quite a bit since the days of having five engines at his disposal with GEICO. Gary Stoffer has had to change his approach to tuning. The team says catastrophic engine failure is the only scenario that could derail its plan to compete at all 16 events. Also, the Stoffers will again be teaming up with Greg and Jim Underdahl and say they could share motors in an emergency. With Underdahl switching to electronic fuel injection the teams will be able to share more data as well. Underdahl says he has been in love with the sport since he was a young boy. Jim Underdahl testing with his father. Another talented Suzuki racer, Katie Sullivan now enters her eighth season of PSM racing and points to Stoffer as somebody who inspired her to get involved. Sullivan knows how difficult it is to find sponsorship. Perhaps her most important deal was one she cut with her father when she was still in high school. It’s a true father-daughter operation, as Sullivan and her dad do all the work between races, getting their motors from Rhett Lougheed of Chino Hills, Calif. The dichotomy of Johnson, a 55-year-old male, and Sullivan, a 25-year-old female, epitomizes the tremendous diversity evident in the class. 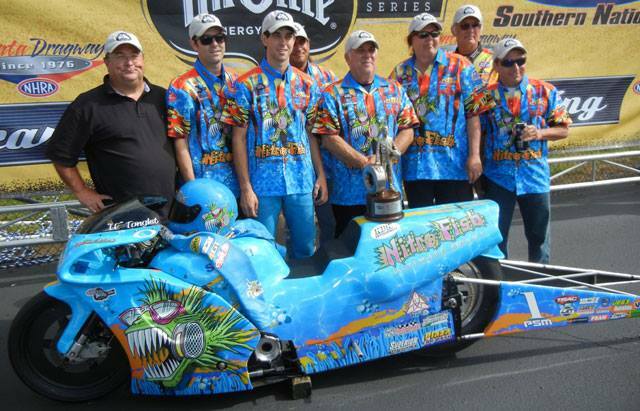 Angelle Sampey with the Gainesville Pro Stock Motorcycle fans. Bloom says it’s the unique personalities that drew him into the class. Even competitors from other forms of racing are crossing over. Brian Pretzel and Joseph Riccardi come from a snowmobile background. 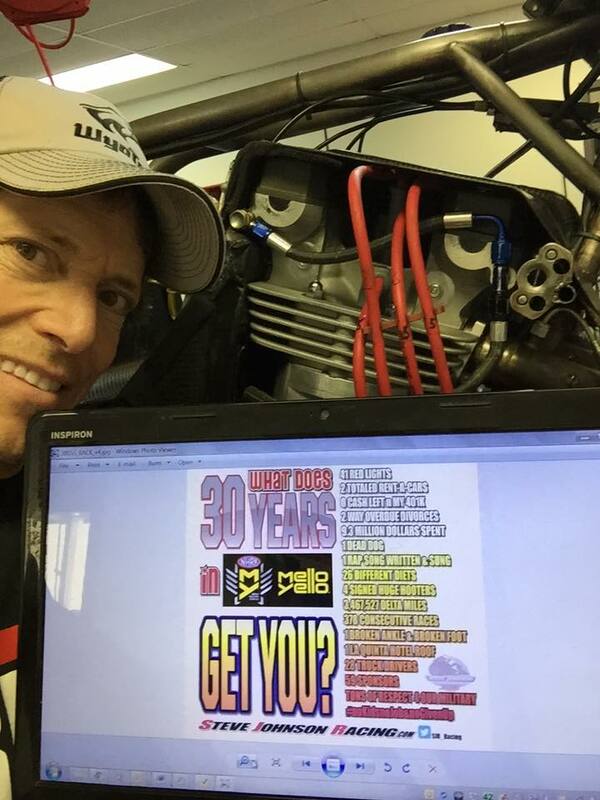 They purchased Underdahl’s old chassis and some Vance & Hines power and plan on going to 10 events. They represent a small team doing its best without a major sponsor. Riccardi is realistic in setting his goals. “I think if we qualify for all the races we are headed in the right direction,” Riccardi said. Kepner is impressed with how close the racing is. 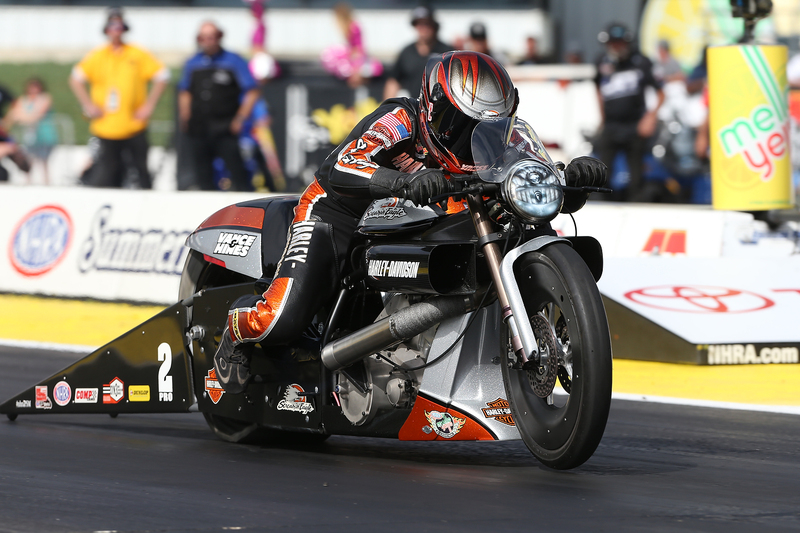 Kepner has a theory for what ignited the interest in the Pro Stock Motorcycle class. 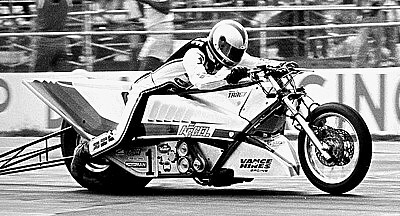 Terry Vance on the Vance & Hines Top Fuel Motorcycle. The bike would later be purchased by Larry “Spiderman” McBride. 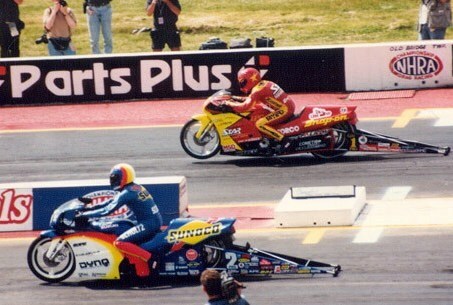 Dave Schultz aboard his legendary Sunoco Race Fuel NHRA Pro Stock Motorcycle Hayabusa. Nearly 15 years after his untimely death due to cancer, the category’s first official NHRA champion Dave Schultz, still leads the class in wins at 45 and leads the NHRA in consecutive wins in a season at eight, a run that included a staggering 34-consecutive round victories. 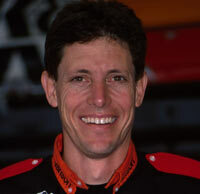 Schultz was named to the NHRA’s list of 50 greatest drivers. 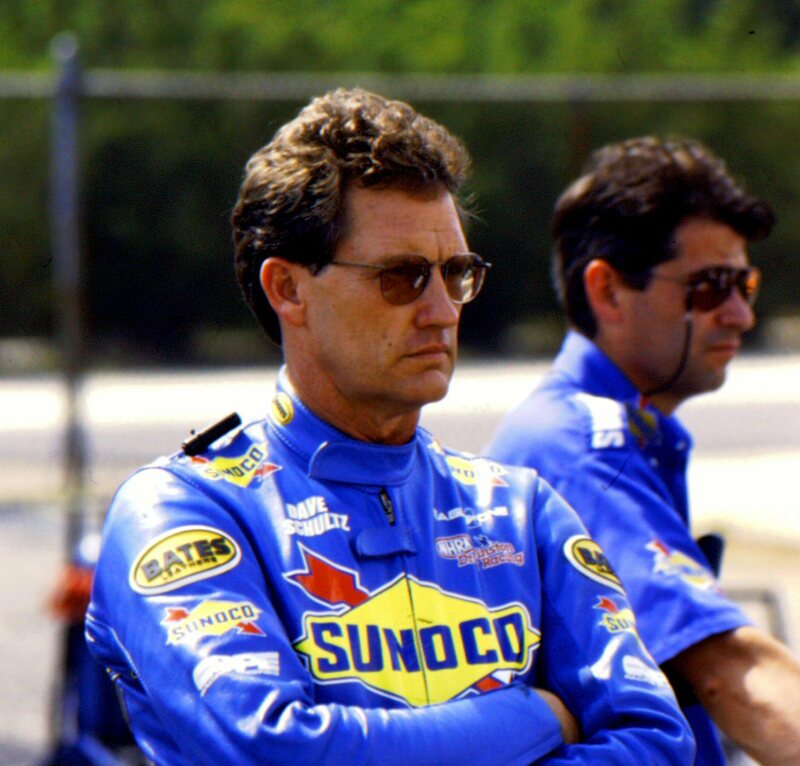 Myers and Schultz had one of the greatest, most memorable rivalries in NHRA history. Perhaps another epic rivalry will soon be born; one we are still talking about at the 50th anniversary season on the class. For now, enjoy the show.